SACRAMENTO – Gov. 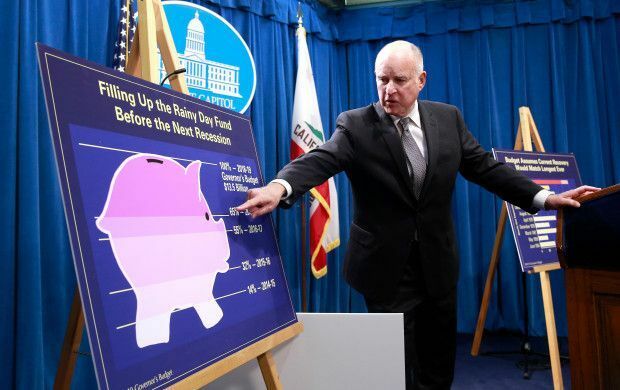 Jerry Brown’s annual budgets have become familiar affairs. During his last two terms in office, Brown routinely offered a budget plan that broke spending records, but also was designed to limit the creation of new programs while girding against the possibility of another recession. The governor’s budget release from last Thursday was true to form. Brown’s 2018-2019 budget plan would spend a record $132 billion in the general fund – which is 4 percent higher than last year and 44 percent higher than the first budget he released in his modern gubernatorial terms (2011-2012). The total budget – including spending from bonds and special funds – tops $190 billion. As columnist Dan Walters points out, Brown’s first-ever budget from the 1970s spent only $11.5 billion in the general fund. But Brown touted his infamous chart showing that balanced budgets often have been followed by deficits. “California has faced 10 recessions since World War II and we must prepare for the eleventh. Yes, we have had some very good years and program spending has steadily increased. Let’s not blow it now,” he said in his budget statement. The governor also warned about the ramifications of the recent federal tax plan, signed by President Trump, which increases the tax bite on high-income Californians by limiting their ability to write off state and local taxes. Unless the state Legislature passes a workaround (such as a proposed plan that allows Californians to designate their state tax payments as a “charitable contribution”), the new rules are expected to reduce revenues in high-tax states. There are other steps that followed in a more fiscally conservative manner. Following the recent increase in the gas tax and vehicle-license fees, the new budget showed a healthy surplus. Instead of spending it on new programs, Brown has earmarked $5 billion to the state’s rainy day fund. That’s $3.5 billion more this year than he is obligated to set aside in case of a coming downturn. It brings the total fund to $13.5 billion. These efforts drew praise from across the political spectrum for their prudency. As the San Francisco Chronicle opined, Brown’s “proposed budget, drenched in a $7 billion surplus, spends money sparingly, dumps dollars into a record rainy-day fund, and dodges big-ticket programs favored by his would-be successors.” Democratic legislators and statewide elected officials likewise praised the governor for spending more without breaking the bank. He even earned the faint praise of some Republicans legislators, who fear that the next Democratic governor will be far more eager to spend beyond Californians’ means. “As usual, the governor gave a good speech this morning,” said Sen. Jeff Stone, R-Temecula. “But as has been the case far too often, the initial budget is the floor and I’m sure the Democrat leadership in Sacramento will now begin the spending spree we all know is coming.” Other Republicans argued that the surplus proved that the gas-tax hike was unnecessary – and urged the governor to return the surplus to taxpayers. There are a number of other noteworthy spending proposals. For instance, the governor plans to quickly start spending $4.6 billion in road improvements, which some observers believe could blunt the momentum of a proposed statewide initiative, which is now in the signature-gathering stage, that would repeal the unpopular tax. The governor also proposes spending nearly 3 percent more on California State University and the University of California systems – a proposal that drew criticism as being insufficient from some education officials. Total K-12 spending would be up by 2.5 percent. Of particular note, the governor proposes the creation of a new fully online state community college to serve the “2.5 million Californians in the prime working ages between 25 and 34 who have only a high school diploma or some college but no degree.” Brown says these Californians – mostly Latino and women – are most vulnerable to recession and to automation in the workplace. The proposed cost to get started is approximately $100 million and then $20 million a year. Social services spending remained stable. The budget boosts health care spending but contains some uncertainty, pending a coming decision from Congress regarding whether it will continue to split the costs of the Children’s Health Insurance Program with the states. The governor continues to boost funding for programs to combat climate change. He continues to pay down the so-called “Wall of Debt,” which hit $35 billion in 2011 and is down to $6 billion in this budget year. Brown was referring to a series of cases that the California Supreme Court has agreed to review this year involving something known as the “California Rule.” That refers to a series of decisions dating to 1955, which forbid government from cutting pension benefits for current employees even going forward (i.e., you accrue the promised benefit through today, but start earning a lower amount starting tomorrow). Unions have challenged some changes in the governor’s 2013 pension-reform law. Brown’s legal team submitted a brief to the court that defends not only the reform law, but which seems to back broader changes to the rule. Clearly, the governor expects the court to side with him, which would not only give the state more latitude in reining in spending, but local governments, too. That’s a longer-term picture, but in the short term the budget proposal is pure Jerry Brown. He wants to spend more on government programs, but wants to be certain that the state isn’t committing itself to huge new spending obligations if the economy goes soft.